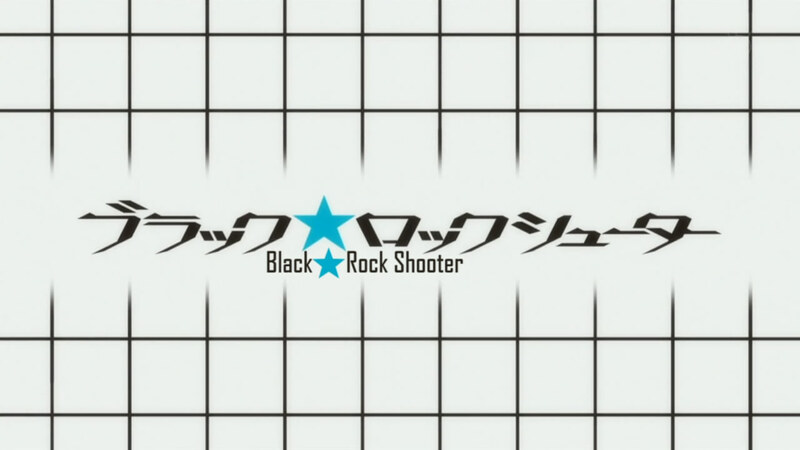 Perhaps no series has ever grown on me in such a short amount of time as Black★Rock Shooter did. 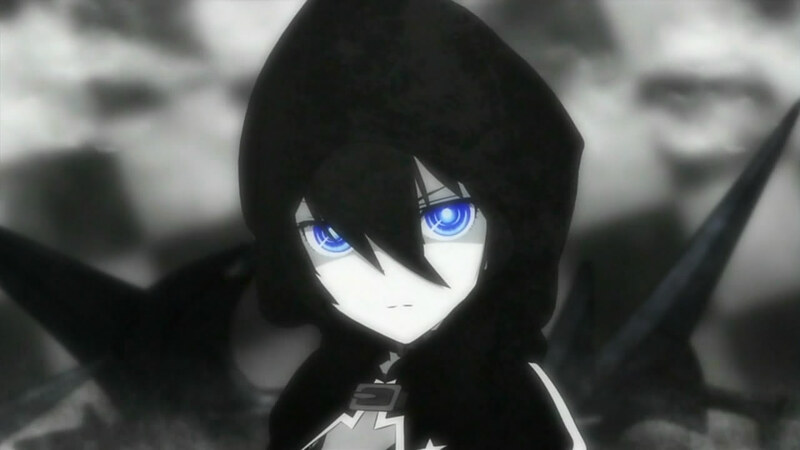 A sadly, but appropriately short series of just 8 episodes, Black★Rock Shooter evolved from a simple illustration created back in 2007, which then inspired a song by ryo of Supercell, which then lead to a 50-minute OVA, which then lead to an expansion of the character into numerous other media, including video games, manga and the subject of this review: anime. At the time of this writing, I still had not fully settled on a ranking for Black★Rock Shooter. I really liked, maybe even loved the series. After a lot of deliberation, I have decided to give Black★Rock Shooter a 9/10 and a place in my personal top 10 anime. The ranking can be found, as always, on the Ongoing Rankings Page. To sum up the plot: a handful of middle school girls have alter-egos in another dimension engaged in constant battle to help the girls in the real world cope with pain. The plot (obviously) expands on this premise, but I have no desire to spoil any more of this wonderful anime than I have to. My main concern going into Black★Rock Shooter was how dark it would be and if that darkness would have enough hints of light to keep me going. Happily, although the anime definitely got creepy and weird (episodes 1 and 2 definitely pushed my tolerances for creepy stuff) I never felt that the anime was hopeless, which kept me going through the worst of the shiver-inducing scenes. In recommending this show, the depths of darkness that it reaches would be my one caution, but it is never gratuitous and very much redeemed at the end. The use of the Little Bird book was a potent agent for maintaining emotional light in the show, as was Mato’s insistent optimism. The anime also does a wonderful job of going for a slow reveal. 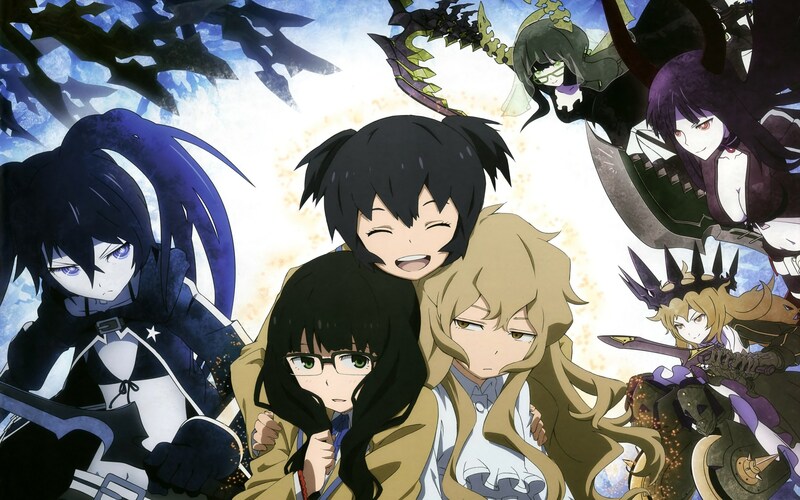 Although it is only eight episodes long, Black★Rock Shooter is impeccably paced, with exposition, plot and character development and revelation all weaved in expertly. The writer behind the show is Mari Okada (responsible for my favorite anime of all time, Blast of Tempest), and in Black★Rock Shooter she’s made me a fan once more. Some people hate being left mystified during shows; I don’t mind it so much, as long as I get the sense that everything will be wrapped up in the end. Okada revealed enough each episode to keep me from feeling left out in the cold and, as I expected, everything was wrapped up neatly and satisfactorily at the end. I will admit that I am a bit mystified as to why I felt and feel so strongly about this anime. I suspect that some of it may be due to the range of emotion it covers and the use of darkness to show how much brighter the light is. Black★Rock Shooter is a hopeful, positive show at its core, and the willingness to take the characters into the depth of their pain and bring them out again is a message that resonates with me as one worth telling. There are certainly some Christ-like parallels going on here, with the fighting girls engaging in their constant battles in order to bear the pain of the girls living in reality. Strength tell Yuu, “We fight because we love you all.” It’s a powerful testimony to the truest nature of love; bearing the pain of others to save them from despair. One other small thing in the show that I loved was the attention to color. I love colors, both as concepts and visual devices, and the parallels between the book “Tiny Bird and the Colors” and the characters was a visual and symbolic device that added a lot to the show for me. Speaking of visuals, the animation is quote good, with heavy CG use in the fighting world. But, as the fighting world is mostly used for, well, fighting, the CG fits and does a good job of defining the fighting world as a separate one from the reality of Mato and her friends. Black★Rock Shooter is a highly recommended show. It’s a message worth telling, filled with hope. It refuses to shy away from the painful realities of life, but also refuses to be overcome by them. Throw in wonderfully done writing and epic, purposeful action, and you have a show that is an incredibly worthwhile watch. No fanservice: Black★Rock Shooter’s outfit might be a little skimpy, but she’s always moving, so it’s a non-issue. Incredible action sequences, made better by the fact that they have intention and significance behind them. A message of hope and perseverance. Characters who experience emotions that everyone can recognize and with which everyone can relate. Darkness is overcome by light, and used to show just how strong the light is.